ホーム Blu-ray Copy チュートリアル Convert Blu-ray to ISO freely with Aurora Blu-ray Copy? The Blu-ray disc is the next successor of the standard DVD format, which provides more storage space. Its main uses are for storing high-definition movies and the 25 GB disc and 50 GB disc are applied for it. The ISO image is a disc image of an optical disc which is ended with an .ISO extension. If you have a lot of Blu-ray movie discs and want to backup them or share them via your Home Server, the ISO format will be the best choice. Now, what you need is just a one-step tool to help you convert these copyrighted Blu-rays to ISO image directly. 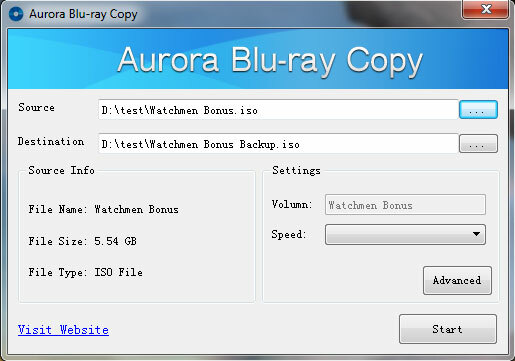 The Aurora Blu-ray Copy can be used as a free Blu-ray to ISO converter software. With which you can use it to convert Blu-ray to computer as ISO image on both Mac and Windows. For example, you can convert Avatar Blu ray to ISO without quality loss. With only this one tool, Blu-ray fans can decrypt most of encrypted Blu ray and convert Blu ray to ISO very conveniently. 1. Go to http://www.bluray-player-software.com/download.htm, free download and install the Aurora Blu-ray Copy. Both Mac and Windows version are available here. You can choose the appropriate version according to your requirement. Here we take the Windows version as example. 3. Insert the Blu-ray disc into your BD drive. Click the button in the Source area to choose the Blu-ray disc you want to deal with. Click “OK”. 4. Click the button in the Destination area to define the output folder. You can input the output file name by yourself. Note: The output folder should be more than 50GB space. 5. Click “Start” to begin to convert Blu-ray to ISO into your computer. This may cost some time according to your original disc size and you computer configuration. How to Burn Blu-ray ISO into Disc on Mac Freely? How to Backup Blu-ray Disc into ISO on Mac Freely? How to Play Blu-ray, DVD, video, audio on Mac Directly?